Bureaucracy. A most prized asset for some countries. Used as a great tactic to avoid doing the hard work assigned to you. It has been used by many governmental public servants departments for centuries. Some countries have realised the amount of money that it wastes for their allocated budget and made these departments more productive. Others just love the system. Maybe it goes hand in hand with their take it easy-going work philosophy. A good work for people who have learnt the system and used it to great effect are paper shuffles. instead of shuffling cards they shuffle paper. I have often heard comments of people for example in France, how they are sent from one department to the next, in search of what the need to resolve, only to find their answer at one of the departments that sent them away. A great example of this was in the French movie, “L’auberge espagnole” or in English the “Spanish Apartment”, where a student wants to participate in an exchange program called Erasmus and is sent from department to department to complete his paperwork. A French entrepreneur arrives in Spain to try to start a business in the country. From experiences in his country he is falsely led to believe that since it takes a 2 weeks to complete everything necessary to start a business in France, that it will be the case in Spain. His translator and assistant assure him he is sadly disillusioned if he thinks he can complete the task in this time, and suggests a more appropriate time frame to complete it, 2 years, which would exhaust his funds to create a business. a few days ago, when there appeared at my house one of those foreigners who, for good or ill, must always have exaggerated ideas about our country one of those who believe either that men here are still the splendid, generous, frank and chivalrous caballeros they were in the seventeenth century. It was one of these foreigners who came to my house bearing proper letters of recommendation addressed to me. Complicated family matters, legal claims to be made, and even vast plans thought up in Paris about investing his abundant capital here in some industrial or business venture, were the motives that brought him to our country. Accustomed to the active pace of our northern neighbors, he assured me seriously that he intended to remain here a very short time, especially if he did not soon find something safe in which to invest his money. It seemed to me that this foreigner was worthy of consideration, and I quickly made friends with him. Full of pity, I tried to persuade him to go home right away if the object of his visit was anything except a vacation. He was astonished at my suggestion, and I had to explain myself more clearly. I said to him, “Look, Monsieur Sans-Delai,” for this was his name, “you have decided to spend two weeks here to settle your affairs?” “Certainly,” he answered me. “Two weeks will be more than enough. Very early the next day we went out together to look for a genealogist, which could be done only by asking one friend or acquaintance after another. Finally we found one, and the good man, stunned by our haste, declared frankly that he needed some time for this; Three days passed, and we returned. “Come back tomorrow,” she said on the following day. “The master is taking his siesta. Excerpts from a translation from Please Return Tomorrow from oncourse system.com. (The link is a google search that will lead you to the file. It is a word document and can only be accessed by clicking on the link which opens the document. This is the only known translation on the internet) The whole story is worth the read and quite comical, and according to my Spanish culture teacher, just as appropriate in this day and age in Spain. Many people have had these experiences in modern day life. Frustrated at the time, often we look back and laugh, as it’s an archaic way of managing an organistaion, and time consumin on your part, that thankfullyyou don’t have to put up with anymore. Even the Germans are partially responsible for the same, but in the end make up for it in their own efficient way. Ever between to a German motor registry for all car registration and licensing. After going through 3 departments to get your official number plate registered for your car, in the end you go outside to a company who is paid to print your number plates. You hand them the official document, and they will print the plates in 2 minutes. Given the initial delay it is a remarkable turnaround for conserving time already wasted. 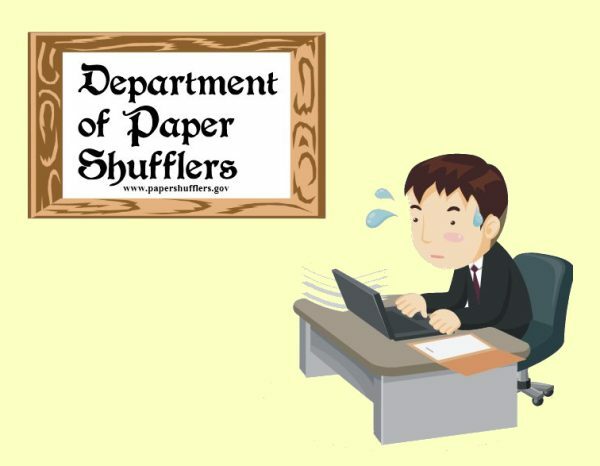 If you have any great stories of foreign paper shufflers, leave your comments below. If you like our post José Mariano Larra- Please Return Tomorrow please feel free to share it with your friends, click the Facebook or Digg like button, or share it with other social media.